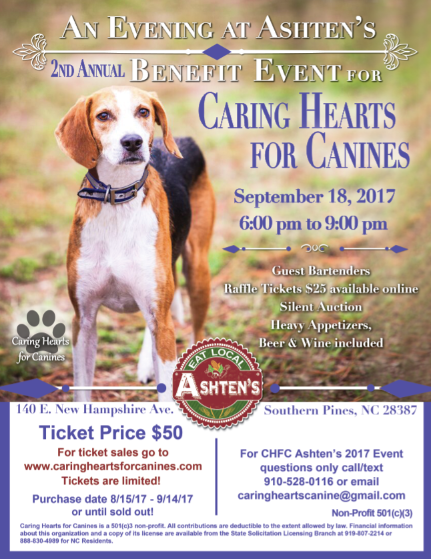 We are so excited to be holding our 2nd Annual Evening at Ashten's Benefit in Southern Pines, North Carolina! Last year was a huge success and we are looking forward to another great year! The event is being held on September 18th, 2017 at 6:00pm to 9 pm. This night filled with great company all to support the pups! Enjoy heavy appetizers, beer, wine, a wonderful silent auction and guest bartenders! Ticket are $50 each. Would you like to donate an item or service to our silent auction? Contact us! Raffle tickets are not tax deducible. State Solicitation Licensing Branch at 919-807-2214 or 888-830-4989 for NC Residents.